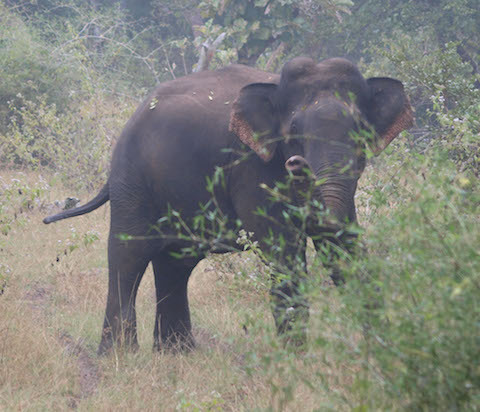 Mudumalai jungles are famous for inhabiting tusk-less male elephants. In Tamil, these elephants are called as ‘Makhna’. Because of genetic disorder sometimes male elephants can’t develop tusk at all. Such male elephants are known to be aggressive and dangerous. As tusks are indicators of health and dominant genes, these tusk-less elephants does not have any chance to mate. Recent encounters with such giant gave me an opportunity to know more about this unique elephant. Streams within jungle are getting dryer day by day. Elephants are on the move in search of fresh grass feed on and slushy areas to have mud bath. We could see almost twenty five elephants at a time grazing on grassland adjacent to the lake within our property at Mudumalai near Masinagudi village. During one of the night safari we sighted a gigantic tusk-less male elephant grazing on same grassland and keeping quite close with the herd. 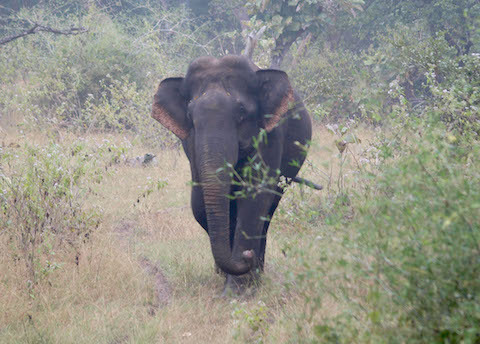 I was surprised to see this Makhna nearby herd of other elephants. In elephants world usually male elephants are solitary and female elephants lead the herd. Male elephants try to mingle with herd during mating season. Next day early morning this Makhna was standing under tree top. And then for almost ten days he was roaming in periphery. We encountered with him during nature walks, moonlight safaris and many guests saw it pulling down trees nearby tree house and tree top. At every time we met this creature at a close distance. Our last meet was really amazing. After morning nature walk me and one of our guests went on top of the Machan (Watch tower) adjacent to the lake. We saw our Makhna crossing the grassland and going towards other side of the lake. We climbed down and covered distance to get some snaps. As usual Makhna allowed us to come close. Suddenly when he was heading towards thickets, he halted for a while. Then started smelling us and kept coming towards us. We were perfectly safe as we were on top of the lake bund and Makhna was on ground 10ft down the lake wall. I could click his all curious expressions. But finally there came a moment when I had to stand up and revealed my identity. Makhna was bit surprised and went back and again halted for a while and kept smelling us. For all this time I feel our Makhna is trying to get company. He is quite curious and explores surroundings on his own. He has become our companion in these pathless woods. But, sadly we had to maintain distance in our friendship. Every sighting every encounter with this giant friend gives me a indeed pleasure of connecting with wild creatures.